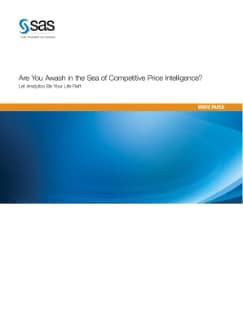 Are You Awash in the Sea of Competitive Price Intelligence? Now more than ever, your guests have access to an ocean of price intelligence on the Web and are using your rates to compare you to competitors to make their buying decisions. As a result, your competitors' rates can have a direct impact on the demand for your hotel. So you collect the data on your competitors' rates, but pricing is difficult enough without struggling to account for your competitors' price strategies. Overreact to your competitors pricing and you can trigger a price war. Underreact and you can be caught in a spiral of decreasing demand for your hotel. This paper describes how to use analytics with your competitor rate data to make better pricing decisions for your hotel.